Looks fantastic! I am in love with rhubarb. I just can't get enough! I think showing your kids that it is okay to let your hair down or eat a slice of cake. Oh, I have to make this. I love rhubarb. I also love your little pink stand! Yum yum yum! This is now on my list of things to do with the 20 million stalks of rhubarb that I have. 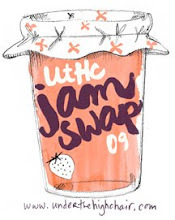 Such a sweet and pretty blog. I bet this would be great with a little whipped cream! Forget about the indulgence, the boys will end up doing things you'll never know about, maybe already have! This is a definite addition to my rhubarb recipe collection. Thanks. BTW - my rhubarb plant is now big- time flowering - any advice? Is it still good to eat? And this is why I can't have kids, I'm too irresponsible! But this cake looks so lovely. This looks DIVINE! Heavenly even. Did you seriously eat the entire cake, or just one piece? I have a similar problem as you when I make my rhubarb cake recipe. It's not an upside-down cake, but all the rhubarb and cinnamony brown sugar sinks to the bottom, creating a fabulous goo that causes me to lose all self control. Hi I stopped by your blog and read a few stories (wedding cake) 10 years in Montreal. Enjoying it and I shall return for more. Beautiful! And so easy, I am impressed. I have been really enjoying the rhubarb lately too. 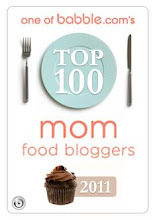 I was thinking muffins are next... but muffins aren't that far away from cake right? Mmmm. I was walking the dogs last night and debated stealing some rhubarb from a house along the way. Maybe tonight! Another fabulous recipe I can't wait to try. My rhubarb is really growing this year, so I think I'll have enough to make it. Have cake for dinner one night. Your boys will remember that night far longer than any of the other delicious meals you prepare. What a gorgeous & delicious looking cake! Oh I love rhubarb but sadly I refuse to buy it in the store so I have not had any this season. When I grew up we always had it in our yard so paying $5.99 lb. at the store is not something I'm willing to do. 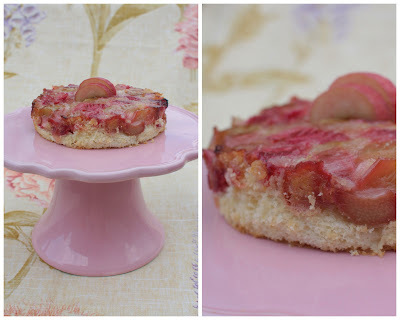 Although if I do manage to get my hands on some fresh rhubarb I would totally make this cake!!! Rhubarb is SO PRETTY no matter how you make it. And I adore that pink cake stand. I also cheat and eat .... not what C. is eating. But he's becoming a toddler fast, and I know those days are numbered! Looks scrumptious. Rhubarb is very difficult to find down here (TX) but enjoyed it while living up north. I love your cake stand! I do the exact same thing! Haha. I never know what to do with rhubarb. You've inspired me. Here in the Southwest, rhubarb is one thing which is in short supply - unlike it was growing up in Northern Canada. However, I have been eyeing a luscious patch in someone's garden down the road. Maybe I'll have to stop sometime and see if they want to share, as I would love to make this cake! Every now and then, it's okay to be bad, especially when faced with a cake that's so good! This recipe looks delicious and the photos too! 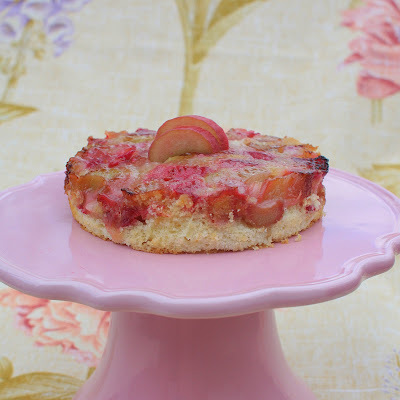 That looks like a PERFECT cake - I love anything rhubarb!!! Must try this! I keep telling myself that I need to change my habits for when Abbi gets older. But I could see why you couldn't resist with this cake! Oh yes, the juices from the rhubarb must flow into that batter like there's no tomorrow! Lovely cake and I LOVE your cake stand! YUM. Another to add to my rhubarb to-make list! Sadly mine is still spindly and pencil-thin. I don't get it! This is looks delicious! So glad we've "connected", I love your blog! 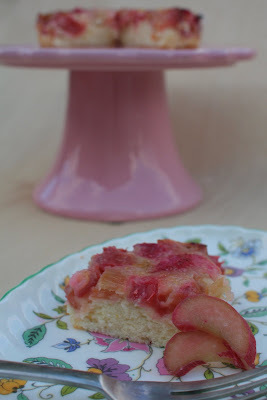 I am a rhubarb addict, in fact, just yesterday I made my brown sugar rhubarb cake. So good! I never tried rhubard! I think here where I am, there's no rhubard! But your cake looks amazing, so I can imagine it's delicious! I have some rhubarb in my garden just waiting for something like this. Looks great!